Don Kindred has four grown children. But his wife, Shellie, insists there’s also a 6-year-old running around. That would be the Corona Symphony Orchestra. At 65, why would he want to raise another “kid”? “I’m passionate about music,” he said. Kindred has led a fascinating life, from appearing on “The Ed Sullivan Show” as a member of the San Francisco Boys Chorus and touring with the Vienna Boys Choir to a 42-year career in retailing. Infusing Corona with some culture is the latest paragraph on his resume, and he’s done remarkably well since he and Shellie moved here 14 years ago. Kindred had been playing string bass since the age of 9. But, he said, “it sat in the corner for 25 years” while raising kids, serving with the Navy in Vietnam and managing Sears’ stores got in the way. So in 2008, he formed the Corona Symphony Orchestra. Marco Mejia, who spent his early years in Riverside, has been conductor of the Corona Symphony Orchestra since it was formed in 2008. That would be Marco Mejia, who was then 22. What attracted him, interestingly enough, was the salary. There was none. Kindred hired him without hearing a note. You can hear how well it paid off on Saturday, March 15, by attending the orchestra’s spring show, “Hopeless Romantics,” featuring Sophia Park on violin and pieces by Dvorak, Sibelius, and Tchaikovsky. The venue is Northpoint Church in Corona, beginning at 7 p.m.
Once Mejia signed up, Kindred recruited the orchestra, with a core group of 55 members ranging from 17 to 70. Five weekly rehearsals are held prior to each of the three concerts each year. The sound is extraordinary, thanks to the talent of the musicians but also, Kindred said, to the acoustics at Northpoint, which seats about a thousand. The Corona Symphony Conservatory is another cultural project Kindred has been successful in developing. The conservatory, which teaches cello and string instruments to students 7 to 17 years old, has grown from 13 to about 100 young people. School district music teachers teach the 13-week class. Kindred is also president of Arts Alive, a formal performing arts council that represent a cross-section of Corona organizations. The include the Corona Symphony Orchestra and Conservatory, Circle City Chorale, Corona Arts Association, Corona Dance Academy, Christian Arts and Theatre, Kids Rock Free and Bridget Smith Photography. Corona may have a way to go before art lovers confuse it with Laguna Beach or Monterrey. But thanks to Kindred and others, we may just get there. NEXT SHOW: Saturday, March 15, 7 p.m. “Hopeless Romantics” will feature Sophia Park on violin and pieces by Dvorak, Sibelius, and Tchaikovsky. LOCATION: Northpoint Church, 988 W. Ontario Ave., Corona. TICKETS: Prices range from $12 to $14, and can be bought at the door, by calling 951-808-3281 or visiting www.coronasymphonyorchestra.org. 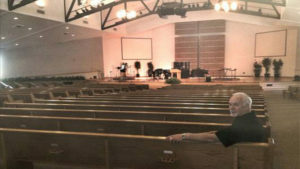 Don Kindred, executive director of the Corona Symphony Orchestra, at Northpoint Evangelical Free Church on Ontario Avenue in Corona, where the orchestra performs three concerts each year. The Corona Symphony Orchestra in concert at Northpoint Free Evangelical Church in Corona. Its next performance will be Saturday, March 15. 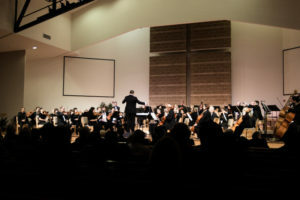 The Corona Symphony Orchestra in concert at Northpoint Free Evangelical Church in Corona. About half of the members are Corona residents, executive director Don Kindred said.